Forget chain restaurants and substandard set menus, these London restaurants ensure your night in theatreland is memorable right from the start. Enjoy a Chicago-themed cocktail and sumptuous dinner before heading to see the show. Homage is located in one of the stately ballrooms of the Waldorf Hilton right next to Covent Garden. As you might expect, it is a prestige restaurant with grand surroundings and impeccable service to match. Guests are invited to dine against a backdrop of Louis XVI-style decor inspired by the grand cafes of Europe. Think towering Corinthian columns, sparkling chandeliers, floor-to-ceiling Art Deco mirrors, and lacquer, gold and velvet accents. During the day, there's plenty of natural light while in the evening glimmering candles and chandeliers make for a romantic setting, ensuring it's the perfect spot for everything from breakfast and brunch to afternoon tea and dinner. Classic dishes such as scotch egg with asparagus and lamb shoulder with pea puree, as well as tempting desserts like Oreo cheesecake with clotted cream and strawberry mousse with champagne sorbet, also ensure the menu has a broad appeal. Heading to a West End show? The hotel's proximity makes it perfect for a pre-theatre dinner and the restaurant regularly partners with theatres to present a menu of show-themed cocktails. 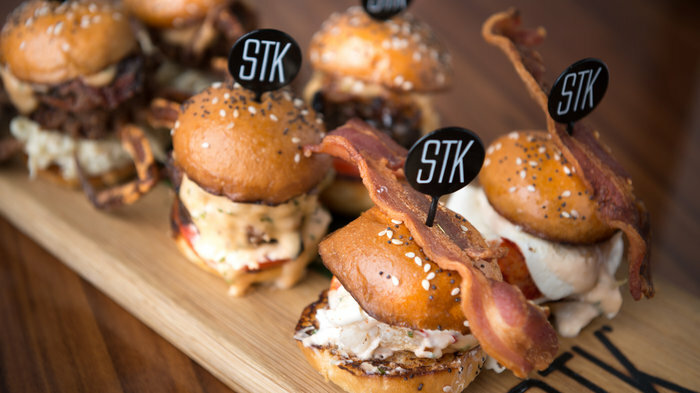 The pre-theatre menu at STK includes wagyu mini burgers and prime rump steak. If you're all glammed up ready for a night at the theatre, be sure to start your night in style with a meal at STK. Found within the luxury ME London, the restaurant brings together glamour and good food, with hand-selected, hand-cut beef and a chic bar/lounge. The pre-theatre menu is a tempting option with a generous menu for just £30. Diners can feast on Japanese wagyu mini burgers, seasonal salad or swordfish ceviche to start; roast black leg chicken, crispy seabass or 28-day aged USDA prime rump steak (£5 supplement) for main; and sticky toffee pudding served with vanilla ice cream and salted malt caramel or mango cream with passion fruit sorbet and mango caviar for pudding. The pre-theatre menu is served between 5pm and 7pm. Two Hawksmoor branches offer express menus that are ideal for pre-theatre dining. With two branches located in theatreland - Air Street and Seven Dials - Hawksmoor is the perfect stop for a pre-theatre dinner. Both venues offer express menus that are available for lunch, until 6.30pm and after 10pm. At £25 for two courses or £28 for three, diners can choose from potted smoked mackerel, roast beetroot salad with goats cheese, and potted beef with bacon and Yorkshires for starter; and rump steak, fillet tail (£5 supplement), ricotta dumplings with winter veg, and royal bream for main. Three tempting puddings are included in the offer: peanut butter shortbread, sticky toffee pudding and pannacotta with blood orange jelly. They even have a map of local theatres on their site, showing which of the two venues is closest to the theatre you're visiting. A glamorous start to your night in theatreland. Located nearby to the West End, Bob Bob Ricard is perfect for an indulgent pre-theatre dinner. While the restaurant doesn't offer a specific pre-theatre menu, it opens from 6pm during the week and 5.30pm on Fridays and Saturday - often the only time slot you can get booked in for! This allows plenty of time to enjoy the restaurant's infamous beef wellington or lobster macaroni and cheese before settling in for your chosen shown. With its renowned 'Press For Champagne' buttons and glamorous Art Deco interior, Bob Bob Ricard is a glitzy way to begin your night out in theatreland. Just be sure to book well in advance as tables can be very hard to come by. A free glass of fizz comes with this set menu. Start your night with a complimentary glass of fizz at HIX Soho, where free bubbles come with the two-course and three-course set menus. Simply quote 'HIX Fizz' when booking to take advantage of the offer and start your night of dinner and a show in style. With British cooking at the heart of Mark's renowned eatery, you can choose from crispy Cruden Bay mackerel with asparagus and ginger broth; grubeens with Chalk Farm watercress mayonnaise and pea shoots; and whipped Elveden beets and Neal's Yard Dairy goats curd and walnuts to start. Three main dishes are on the menu, including fish pie and lamb loin chop, and desserts include Peruvian Gold chocolate mousse and blood orange cheesecake. Feast on classic French dishes in a glamorous Art Deco setting. The grand Brasserie Zedel offers a prix fixe menu, with two courses for £9.75 and three courses for £12.75, and also a formule menu, with three courses for £19.75 that includes a glass of wine, water, and coffee. Located just off Piccadilly Circus, it's the perfect spot for a bite to eat before a night at the theatre, and with beautiful Art Deco interiors - high ceilings, marble pillars, brass rails and large mirrors - it's an unusually glamorous setting for such good value. Choose from classic French dishes such as coq au vin and beef bourguignon. Enjoy a number of theatre and dinner packages at this Parisian-style brasserie. A grand Parisian-style brasserie in the heart of Covent Garden, Balthazar is a tempting destination for a pre-theatre pit stop. In partnership with Love Theatre, the restaurant offers a number of dinner and theatre deals, with tickets to a show and a two-course dinner starting from £75, and tickets, dinner, a programme and champagne packages starting from £95. Alternatively, if you've sorted the theatre tickets yourself, you can simply book in for the menu prix fixe, which is served from 12pm to 4pm Monday to Friday and 5pm to 6.30pm Monday to Sunday. The menu offers the choice of three hors d'oeuvres: melon and bayonne ham, flame grilled mackerel or soup de jour. Entrees are Cornish sole meuniere, roast chicken breast and leek tarte tatin, while dessert choices include profiteroles and assiette de fromage (£3 supplement). Two courses are £17.50 and three courses are £22.50. Feast on seafood ceviche and pork-filled buns before heading to the theatre. With an express menu available every day until 6pm and after 10pm, rock 'n' roll Japanese eatery Flesh and Buns is a good alternative to your standard pre-theatre dining options. Designed for sharing, the menu includes three small dishes: mixed seafood ceviche, salmon avocado roll and, a menu highlight, Korean fried wings with spicy sour sauce and sesame. For main, choose between three of the restaurant's infamous buns, with crispy piglet belly, salmon teriyaki and crispy duck leg on offer - don't be fooled by the deceptive measly portions, these buns are unbelievably filling. Unfortunately, the Instagram-worthy s'mores aren't on the express menu, but the equally tasty sobacha brulee, kinako black custard donuts, and Bone Daddies sundae are. Two courses and a drink cost £19 and three courses with a drink cost £22. A true bargain. Gregory Marchand's first London restaurant is perfectly positioned for pre-theatre dining. While it doesn't technically offer a pre-theatre menu, Covent Garden restaurant Frenchie is perfectly positioned for a bite to eat before or after a West End show. Either book an early table or, even better, if you've got tickets to a matinee, take advantage of the very reasonably priced lunch menu, with two courses for £22 or three for £28. The first London restaurant from Gregory Marchand, aka "Frenchie", presents dishes that are heavily influenced by his travels from London to New York through Spain and Hong Kong, with both small and large plates to choose from. Spanning two floors, it features a ground floor bar for walk-ins and a downstairs restaurant. Enjoy a pre-show dinner in London's newest luxury hotel. As the name would suggest, London's newest luxury hotel, the InterContinental London O2, is right next door to the O2 arena, making it the perfect place for a pre-show dinner. As luck would have it, The Market Brasserie, one of the hotel's five eateries, offers a pre-show menu. With two courses and a glass of Prosecco for just £25, it's extremely good value and a monthly changing menu ensures the dishes are always fresh and seasonal. Expect dishes such as confit duck leg with creamed savoy cabbage, pan seared fillet of hake with tomato and tarragon cassolette, and pecan tart with caramel ice. With floor-to-ceiling windows and an open plan kitchen, it's a striking venue to enjoy a feast before screaming the night away at a concert next door. From cheap budget places to stay to luxury 5 star hotels see our deals for hotels, including Radisson Blu Edwardian Mercer Street from 70% off.